Central American migrants stay at a former factory used as a shelter in Piedras Negras, Coahuila state, Mexico, on the border with the U.S., on Wednesday, Feb. 6, 2019. Hundreds of migrants in a new caravan that just reached the U.S. border may have to wait in Northern Mexico for months because the U.S. agents in the tiny Texas town where they want to cross can only currently process fewer than 20 migrants a day, Customs and Border Protection officials told NBC News reported. 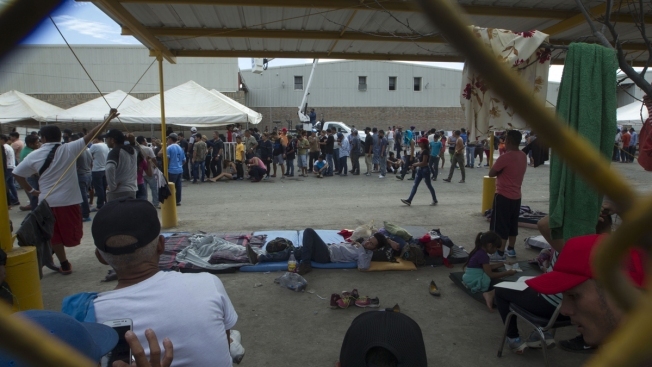 More than 1,800 migrants arrived in Piedras Negras, Mexico, on Tuesday, just across the Rio Grande from Eagle Pass, Texas. Border agents in Eagle Pass can process fewer than 20 asylum seekers a day, but as of now, there are no plans to beef up the number of officers who can administer a credible-fear interview, the first step towards seeking asylum. In a credible-fear interview, an asylum seeker tries to establish there is reason to fear returning home. A spokesperson for the Texas Department of Public Safety declined to comment. A spokesperson for Customs and Border Protection did not respond to a request for comment.